Language Arts and Literacy encompass skills in listening, speaking, reading, and writing. Listening and speaking skills are developed and practiced throughout the GreenMount curriculum. Our reading and writing programs weave the learning and practicing of essential skills within the experiential teaching approach of Reading and Writing workshops. Each workshop starts with a mini-lesson that teaches an essential skill. The students have independent writing or reading time in which to practice the skill. The period concludes with sharing of discoveries or a final teaching point. During the independent work time, the Language Arts teacher meets with students, discussing and guiding their work. Using the Reading and Writing Workshop approach allows the students to work at their own pace, and allows the teacher to move each student forward in their mastery of reading and writing skills. In the lower grades, explicit phonics and fluency instruction through Fundations™ is a part of every reading and writing time. In the older grades, the emphasis moves from learning to read to reading to learn. Students become aware of their meta-cognition and purposefully use critical thinking skills. In addition, GreenMount uses the vocabulary program Wordly Wise™ throughout all grades. 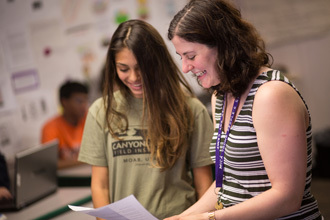 Our Language Arts programs are research-based and guided by the findings of premier literacy researchers: Lucy Caulkins, Nanci Atwell and Donald Graves. Additionally, we have adopted many aspects of the Maryland State Voluntary Curriculum, which is based on years of research and best practices. Our scope and sequence reflects many of the VSC principals, while supporting our school’s approach to learning.